Oh, dear... I have just purchased (well, it was really almost more of a gift than a purchase, thanks to penguinmaster's great kindness) my first Estie, a single-jeweled transitional SJ, which seems quite a mouthful for a pretty little green pen. It had been calling to me for two days. I'm quite new to fountain pennery, having only ordered my first two pens-- both safaris, one EF and one 1.1 italic-- just two short weeks ago. But I think I'm hooked. I've stopped using other pens altogether. I got a weird little thrill refilling their ink at my desk this morning. Is it strange to be excited about receiving a 50-some-odd year-old pen? Because I am. But I don't have a problem. It's just one Estie, right? It's not like their nibs are interchangeable or anything. Hahaha... Ocala? Why, that's just down the road apiece! It won't be your last Estie, coz' the nibs are interchangeable! You might be called if there's ever need for an intervention. ME? a registered Estie ENABLER assist in an Estie *INTERVENTION*?! See, this is what happens, though, when you have a budding addict planning her own intervention! I now have two 'SJ' Esterbrooks - why two since I they are both plain black? Well the reason is the first one was such a delightful pen, and the price was so modest, that I thought I'd just get another so I could have my choice of ink colors without having to flush and refill. The first one I purchased needed a new sac, but what a simple job it was! Soaked the barrel in water for a day, the nib unscrewed smoothly, and the front sections came off without having to use undue force. Bought a new silicone sac and 'Sac Shellac' from Wood Bin. (Much thanks to Richard Binder's site where I learner all I need to about doing this simple, yet essential replacement - http://www.richardsp...eplacement.htm). One pen came with a 9668 nib, the second pen, (already restored when I successfully bid on it on Ebay), came with a 9550. I also obtained a NOS 9555 nib. One truly nice feature about these Esterbrooks is the easy nib exchange, and there is very good advice on to hold the nib as you unscrew the barrel on the web. Esterbrook has a large variety of nibs, here's a link to a chart http://www.snyderfam...t/estienibs.htm. Both pens, and all three nibs, are, at least in my limited experience, very nice to use. I have a Cross Townsend (my first fountain pen purchase back in 2004), and I have to credit that pen for leading me to purchase the first Esterbrook. I did not use my Townsend as much as I would have liked to, because of the cost of the pen I didn't want to carry it around casually. So I picked up the Esterbrooks, and am so very satisfied I did. But I also think getting these Esterbrooks has infected me with the symptoms of the "pen acquisition disorder", and these have manifested themselves! My wife asked what I would like for my birthday present, and my choice was a Pelikan Souveran M400, (about the size of the Esterbrooks), but I now have to wait for two more weeks before she turns it over to me. Ah well, being assured I will be getting it makes the delayed gratification worth while. I have no doubt that I will continue to put my Esterbrooks to much good use, and though not as stylish or prestigious as other fountain pens, I have no doubt that they are every bit as good as many costing 10 times as much at flowing ink onto paper. My first is actually my first three. There's the red SJ with a 9450 nib and a dawn gray LJ with a 9461 nib and a copper SJ with a 2668 medium nib plus a 2968 broad nib redone by Pendleton. So, thus far I have 3 restored pens with a total of 4 nibs for $99 total to my door. At a rate of about $30 per pen I can have quite a nice bunch of pens for not a lot of cost. Common sense isn't "right wing" unless you are too far to the left. Aligning the tines is a very simple operation, requiring (for tools) only your loupe and a couple fingernails. Look for a pinned topic in the Repair Q&A forum. I was a little too embarrassed to post, cos your pens all look nice, but it's been a great pen to me. I got this months back, but I had it sent to my sister in the US to save on shipping, and only got it the last week of July. It looks coppery in real life, but it was listed as red, and does look red in pics. I was the only bidder, and when I got it, saw why. It has no clip, no jewel at the top, and the 9668 nib looks grungy, kinda like my doggy. But like my dog, I like it. I like the way it writes, (the pen, not my dog) and I'm still happy about it, and with it. http://pics.livejournal.com/shuju_the_red/pic/0001f13z/s320x240 "Of all the things I've lost, I miss my mind the most." For $4.99 it sounds like a great deal even with the cosmetic issues. Those don't affect how it writes anyway. 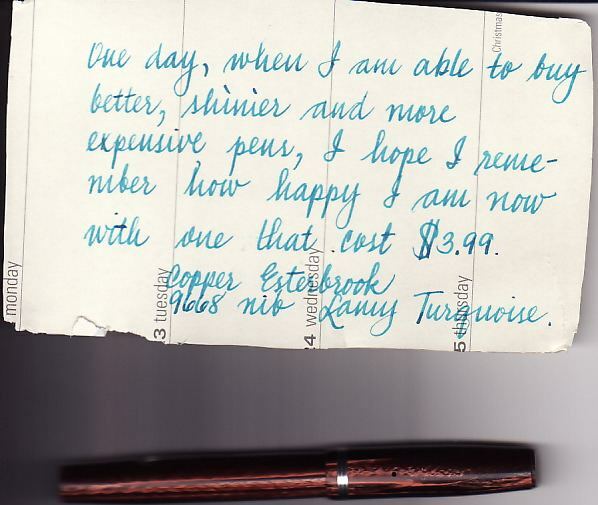 And later when you are "able to buy better, shinier and more expensive pens" you can spend $3x for a restored Estie from Tom or Bruce and have a pen as nice as any other pen anywhere. It is amazing what those guys do with Esties. They are beautiful when they finish with them. I've got one from each of those guys in my pocket right now and would match my pens to anything anyone has for looks and writing quality. The only thing my pens won't match and your wouldn't either is the "snob" quotient and frankly I could care less on that one. Oops.. left off the dollar sign. That's thirty something not 3 times what you spent on this pen. Edited by LDB415, 16 August 2009 - 14:48. For $4.99 it sounds like a great deal even with the cosmetic issues. Those don't affect how it writes anyway. And later when you are "able to buy better, shinier and more expensive pens" you can spend 3x for a restored Estie from Tom or Bruce and have a pen as nice as any other pen anywhere. It is amazing what those guys do with Esties. They are beautiful when they finish with them. I've got one from each of those guys in my pocket right now and would match my pens to anything anyone has for looks and writing quality. The only thing my pens won't match and your wouldn't either is the "snob" quotient and frankly I could care less on that one. I can feel an obsession coming on full blast, put on hold only by economics. I see I made a typo by leaving off the dollar sign. I meant to say spend thirty something on a really nice Estie not 3 times what you spent on the first one. Still one of the bargains in pendom I think. I just finished 2 almost indentical Blue SJ's this morning. Bowee are they purrrdy! I think I'm gonna call them The Boppsy Twins. my personal favorite the LJ doesn't seem to have it as often or as prominantly. Yupyup, I was a bit taken aback at first, but I'd been following the for sale board so I pretty much figured you meant thirtysomething dollars. Still very good bargains, I hope I can snag a few soon if finances allow. I just took delivery of my first estie, a gray icicle with a 2668 nib. I believe it was never inked but I had to, I brought it to use as I do with all my pens, not to add to a collection . I did ink it with Waterman Florida Blue after testing the sac with water. I have one thing to say; now I understand what their all about. I'm a new fan. Yes it was one of 2 pens Mr. Clarkson was selling last week. Is there a place I can get a listing of all the nibs available, their numbers and type? Also any recommendations to read on the pens that were made and their history. And here's the big Esterbrook history page.